The following chart shows a demand curve that, without much argument, we can point to one man for the explosive increase. 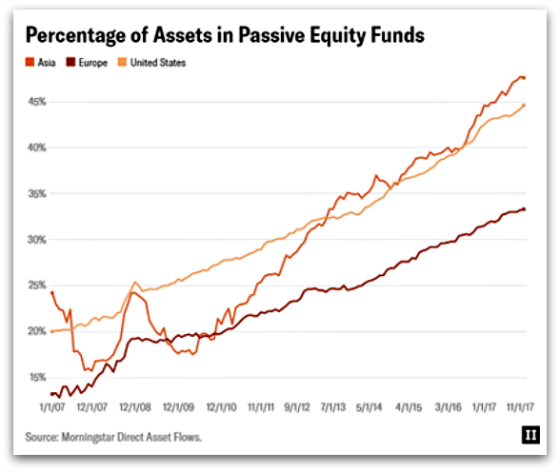 It represents the percentage of assets dedicated to passive investing via index funds and Exchange Traded Funds (ETFs). And that man is John Bogle. Talk about leaving a mark on the world. John Bogle most definitely did when he founded the Vanguard Group of Investment Companies in 1974. Vanguard, as virtually every investor knows, is the money management giant that has had a razor-sharp focus on index funds, the success of which has now led to them having over $5 trillion in assets. Only Blackrock is larger with $6.3 trillion of assets under management. John Bogle died on January 16th, 2019. He left an extraordinary legacy. When you have Warren Buffett saying the following about your accomplishments then you know you have put a small dent in the universe. In the obituary about Bogle in the New York Times, I was drawn to his simple insight that inverted how most people thought about investing and has now led to a runaway train that will only gain more momentum. What a brilliant insights. You win more by not losing (paying high fees) than by outperforming the market. And I will show how right Bogle was very shortly! 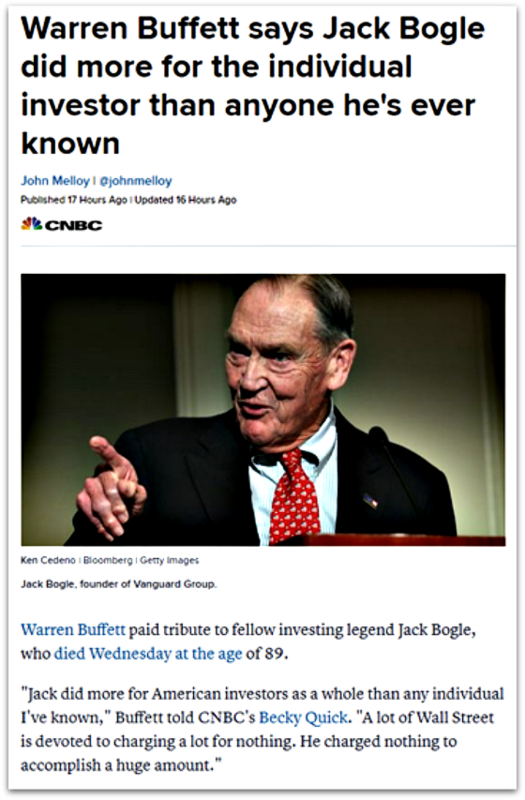 Although Bogle was a very wealthy man with an estimated net worth of $80 million, it cannot compare to the Johnson family who founded Fidelity (over $15 billion!!) and Larry Fink, who is also a billionaire, and founded Blackrock, which, as previously mentioned, is the largest money manager in the world with over $6 trillion in assets. 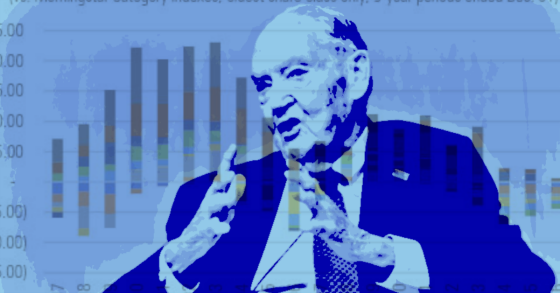 Bogle earned far less than other founders of money management firms because he structured Vanguard so that the investors were the owners of the firm. They not only benefited from the lower fees being charged but also from the growth in the firm that its low-cost structure catalyzed. Bogle was a very generous man as the following excerpt shows. Now let’s wrap up by showing how Bogle’s insight was quite prescient. 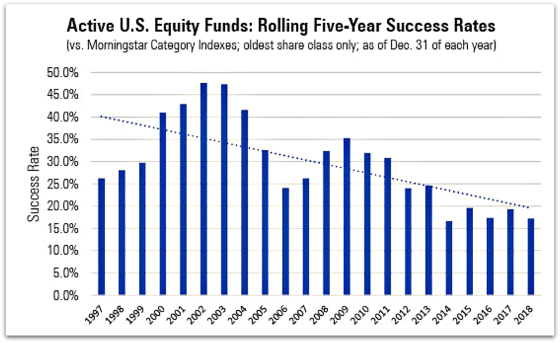 The following charts from Morningstar show how difficult it has become for active managers to outperform indexes. After peaking at about 47% in 2002, the success rate has steadily gone down over the past 16 years such that it is now approximately 16%. 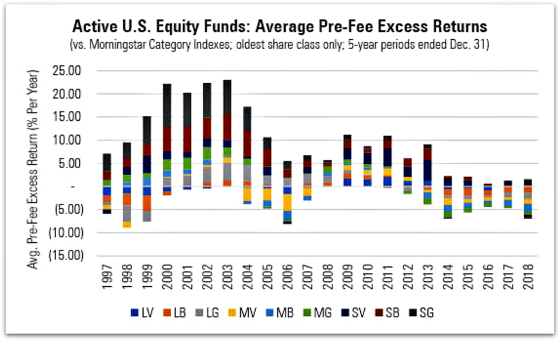 The main problem is that the excess return generated by active managers pre-fees is very low such that when you deduct the higher fees, relative to passive funds, the probability of outperformance drops significantly. Not many people have been revolutionaries in terms of catalyzing extraordinary change that altered the directory of an industry, society, and/or world. John Bogle did and we are better off for it. Rest in peace. If you take a long term evaluation of performance, say over 10 to 15 years, the percent of money managers who beat the market dwindles to about 5 or 6 percent!